Twenty-five thousand feet above Malta - that is where the Spitfires intercepted the Messerschmitts, Macchis and Reggianes as they swept eastwards in their droves, screening the big Junkers with their bomb loads as they pummeled the island beneath - the most bombed patch of ground in the world. 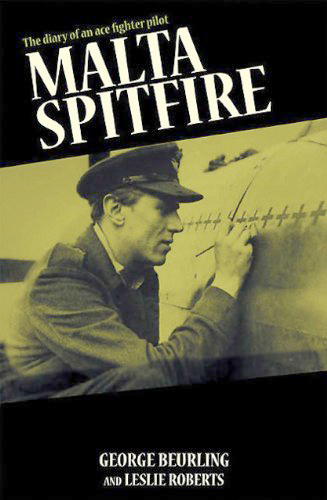 One of those Spitfire pilots was George Beurling, nicknamed 'Screwball', who in fourteen flying days destroyed twenty-seven German and Italian aircraft and damaged many more. Hailing originally from Canada, after hard training and combat across the Channel, Beurling finally made it to Malta in the summer of 1942. Malta Spitfire tells his story and that of the gallant Spitfire squadron, 249, which day after day climbed to the 'top of the hill' to meet the enemy against overwhelming odds. The reader has almost the sensation of being in the cockpit with him, climbing to meet the planes driving in from Sicily, diving down through the fighter screen at the bombers, dodging the bullets coming out of the sun, or whipping up under the belly of an Me for a deflection shot at the engine. This is war without sentiment or romance, told in terms of human courage, skill and heroism. A classic, first published in 1943. 01 May 42 - Beurling gets first of 31 kills in a sweep over Calais. 20 May 48 - Beurling killed in accident en route to fly for Israeli Air Force.